My Struggle to Find a Satisfactory Electric Mandolin - Mandolin Maniac! More than ten years ago I was having great fun with my acoustic mandolin, and since I love to play electric music as well as acoustic, I made a pilgrimage to Elderly Instruments in Lansing, Michigan – my favorite musical instrument store – to try some electric mandolins and possibly buy one. As usual I had a good time trying a number of the instruments – they have as good a selection as I’ve found anywhere – and finally settled on and purchased a Rickenbacker solid body mandolin. It was a very cool looking instrument but, like all the Rickenbacker instruments I’ve ever seen, was a bit quirky in its construction and not as well crafted as I would have liked. Still, it played pretty well, though significantly better after my favorite instrument technician, Tom Murray of Custom Guitar and Bass in Bloomfield Hills, MI set it up for me. The playability notwithstanding, when I got it hooked up to an amplifier I couldn’t get much richness of tone out of it. It was persistently and piercingly sharp in tone quality in spite of my efforts to adjust some middle (I didn’t expect much “bottom”) into it. I did my best with the controls of my Line 6 Spider III, and then tried hooking up my old favorite Line 6 Pod so I could try more amplifier models and other means to modify the sound. No matter what I did I couldn’t get any “guts” out of it, so I played it rarely in public even though I kept it for nearly ten years. After a very disappointing public performance I stopped playing it in public at all, instead playing my acoustic zebra wood mandolin with standard stage microphones, an approach that is always difficult to manage though the sound can be decent when the microphone is positioned properly. Then, last May, I found a Chinese-made electric mandolin in a music store on Hilton Head Island when I was vacationing there and purchased it. It was much cheaper than the Rickenbacker, but relatively sound in construction, and after trying it with an amplifier I thought it had somewhat more robust sound that the Rickenbacker. Not long after I got it home I had Elderly take the Rickenbacker on consignment and it sold on-line within 8 hours for the same price I had paid for it ten years earlier. Subsequently I took the Chinese mandolin (a Morgan Monroe brand – the name makes me laugh) to my instrument technician friend Tom Murray, and he made it play just as well as the Rickenbacker if not better. Then I took the Morgan Monroe to a gig while Tom Murray was re-fretting my favorite zebra wood mandolin. I tweaked the controls on the instrument, the Line 6 Pod, and the Line 6 Spider III to the limits to try to get more guts out of the Morgan Monroe, but in the end it wasn’t enough better than the Rickenbacker to satisfy me. The sound is still too shrill and there isn’t enough mid-range to give it the robust sound I want, and get from the zebra wood mandolin. I am again disappointed. My plan going forward is two-fold. I will take the Morgan Monroe back to Tom Murray and discuss string types and gauges with him, as well as any potential pickup position adjustments that might give it better sound. 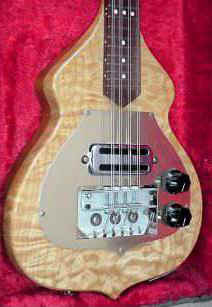 I will also discuss in detail the potential for electrifying my all-time favorite zebra wood mandolin. If I can’t get closer to the sound I want with the Morgan Monroe I will probably sell it off and just use the zebra wood mando from then on. The zebra mando has a rich, full sound with an amazing amount of richness and mid-range in the sound, and if I can give it any capacity for plugging it in I think it will be even more useful and will give me the sound I have come to love playing it acoustically. Last night (September 27, 2013) I played a gig with my friend Chris Hedly’s acoustic-electric Greco mandolin. (Thanks, Chris!) Initially going acoustic, the volume was so weak I was buried by virtually anything else going on – not a good thing when you’re playing “lead” mandolin. Then I was allowed to plug into my buddies little amplifier, which made it audible, but the sound was still so thin and all-treble that it was a struggle. It never really sounded that good no matter what I did, unfortunately, but maybe I’m spoiled by the rich tone of my zebra wood mandolin. I guess now I’ll be looking for pickup or microphone systems that might give me a good electric sound when I need a volume boost. Do you have any good ideas? I’ve lost my faith in the existence of a good sounding electric mandolin.